As we close out 2017 it, finally looks like the Trump Administration will manage to advance at least one part of its policy agenda. The repeal of Obamacare and the wall between the US and Mexico seem to have died a death but tax reform looks set to land in early 2018. As such our focuses for the USD are threefold in 2018 with each geared to take the greenback higher, lower or nowhere. We take the measures within the Senate proposal more than that of the House and while that means that the corporate tax cut will not emerge until 2019, the incentives on investment begin in 2018 and as such, the repatriation flows represent a reason for continued USD strength. We must balance this however with the dynamics of the deficit which will explode under this tax plan and will act as a break on USD strength. Chatter over a US recession has increased from negligible levels over the year and while conditions are not set for growth to reverse anytime soon, movements in bond markets are suggesting that investors are becoming increasingly cautious over the outlook for the US economy. The longest run of continuous expansion for the US economy is 120 months; this run is 103 months old as we close out the year so contrarians will be focused in on how long the current run can last. We think that the Federal Reserve will raise rates twice in 2018 but the nomination of Jerome Powell as the new Fed Chair limits the likelihood of a policy surprise anytime soon and with the labour market as tight as it is we look for moves in core inflation measures to delineate whether the central bank needs to drive rates higher. 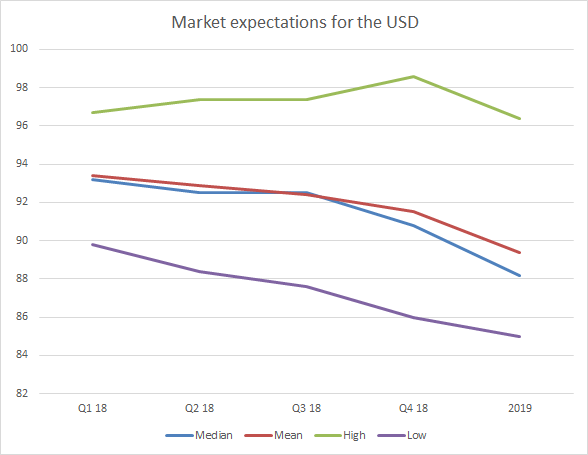 The fears for the USD stem from the risks of a trade war with China. Despite calling the leader of North Korea ‘short and fat’, Trump’s recent Asian trip was rather quiet. That being said it is the region that is Trump’s 3rd rail – all the power is there but touch it and you die. It is not too much for us to say that Trump Administration has not meaningfully passed any legislation this year. Trade terms and tariff movements do not need to be passed by Congress however, they can easily be done by Executive Action. As a candidate, Trump pledged to label China a currency manipulator “on day one” of his administration. That didn’t happen. He also said he’d bring cases against China for “unfair subsidy behaviour” and use “every lawful presidential power to remedy trade disputes,” including the application of tariffs. He once floated a 45 percent on imports from China, then denied bringing it up. Indeed, North Korea and self-interest is staying Trump’s hand for now. China’s influence with North Korea is crucial for holding off a trade war. Skirmishes around the edges on intellectual property could easily provide kindling for something more intense with steel, grain, tech, apparel, vehicles, appliances and cosmetics the likely most affected industries from any trade disputes. 2018 is also an election year in the US. This is not at a Presidential level however with all 435 seats in the House of Representatives and 33 of the 100 seats in the Senate, alongside 39 State Governorships are up for grabs. Legislation has been one way of strangling the Trump administration but revoking their hold over both parts of Congress will go some way to stopping his reform agenda. We think it very unlikely that the Democrats will be able to meaningfully change the Senate but they need only 25 seats to flip in their favour to take back the House.